Unless you look very closely, you will find it difficult to see me in the tree tops of my natural habitat of the rainforest. I move extremely slowly because I need to conserve as much energy as possible, and I want to avoid being eaten by an eagle or jaguar. I am rapidly losing my habitat because humans are clearing the rainforests where I live for agriculture, so please adopt me and help keep my habitat and species protected. 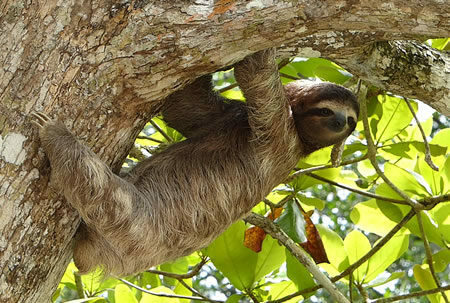 Sloth’s are famous for their slow movement as well as spending the vast majority of their lives hanging upside down from the trees they live in of the South African and Central American tropical rainforests. The sloth’s name is closely related to the word slow because of its extremely low metabolic rate and rather sedate movements. All six species of sloth are facing threats from habitat destruction. 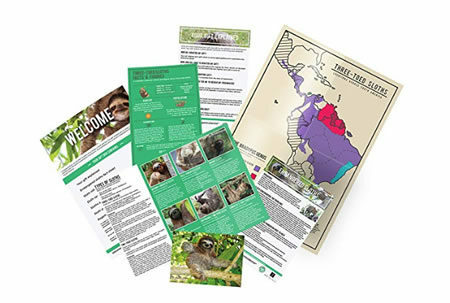 A sloth adoption is a great way to learn about one of the world’s most fascinating mammals. Adopting a sloth for a friend or family member makes for the perfect gift. The sloth poster is a fabulous decorative item. Sloths move very slowly because they have extremely slow metabolism which is an evolutionary adaption to their low energy diet that also allows them to avoid being detected by predators. Sloths are almost completely helpless when they are on the ground, but are fantastic swimmers and of course are very adept in the tree tops. The average sloth travels about 41 yards per day which is less than half the length of a football field. Sloths sleep up to 15 hours a day and spend the remaining 9 hours of the day foraging for food, trying to maintain a low body temperature by staying out of the sun and remaining in the shade. A sloth spends the vast majority of the day sleeping, awaking to feed for just 9 hours. They move only when it is absolutely necessary and at a very deliberate pace. Sloth’s move at an average pace of about 4 metres per minute but if in danger are able to speed up but not by very much and when on the ground move far slower. Their limbs have evolved for grasping and hanging but not to support their weight. Whilst sloths sometime do sit on top of branches, typically they eat, sleep and even give birth whilst hanging from branches. On average female sloths bear one offspring every year following a six-month period of gestation. For the first six months of its life, the baby clings to its mother’s belly as she moves through the trees. After a baby sloth matures and leaves its mother at about six months of age, it continues to remain within the range of its mother and continues to communicate with her through calls. An adult sloth spends 15 hours a day sleeping and spends the rest of the day lumbering through the trees feeding. In order to conserve energy, they move slowly and maintain a low body temperature of between 30 to 33 degrees. They are careful to ensure they don’t overheat often heading into the shade to keep their body temperature regulated. A sloth’s diet consists of leaves, twigs and buds. Because sloths do not possess incisors, they have to trim down leaves by using their lips. Because they have slow metabolisms, they do not need much food to survive. In fact, it takes sloths days to process an amount of food that other mammals are able digest within a few hours. There are six species of sloth and not all are endangered. Some however face the threat of deforestation in the rainforests of South and Central America, which they rely on for food and shelter. 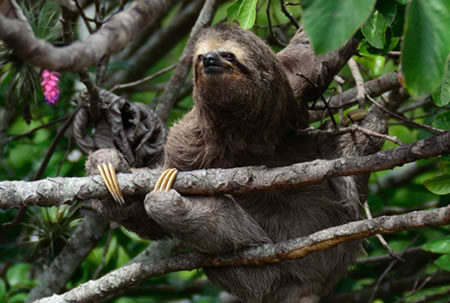 Sloths spend the vast majority of their time high up in the trees, coming down from the trees no more than once a week primarily to relieve themselves. They like to stay in the trees because it keeps them protected from big cats and birds of prey. It is much easier for a sloth to stay camouflaged and motionless when they are not on the ground. By now you will know sloths are rapidly losing their habitat as a result of humans clearing rainforest for agriculture. Another serious problem sloth’s face is humans taking them from the wild and using them as props to take selfies with. That kind of stress causes sloths a massive amount of stress and their life spans can be cut from 40 years to just 6 months as a result. Sloths also lose their lives when they come into contact with electrical lines and are also hunted by humans. Many are the victims of animal trafficking and are sold on as pets, which is a terrible idea because they need such a specialised environment to survive. There are six species of sloth and two main kinds, sloths with two toes and sloths with three toes. This is actually a misnomer because the difference is in the front limbs rather than on the toes. The sloth is about the same size as a medium sized dog, but ancient sloths once grew to the size of an Asian elephant, these sloths however went extinct about 10,000 years ago. Sloths can be found in the rainforests of Central and South America.